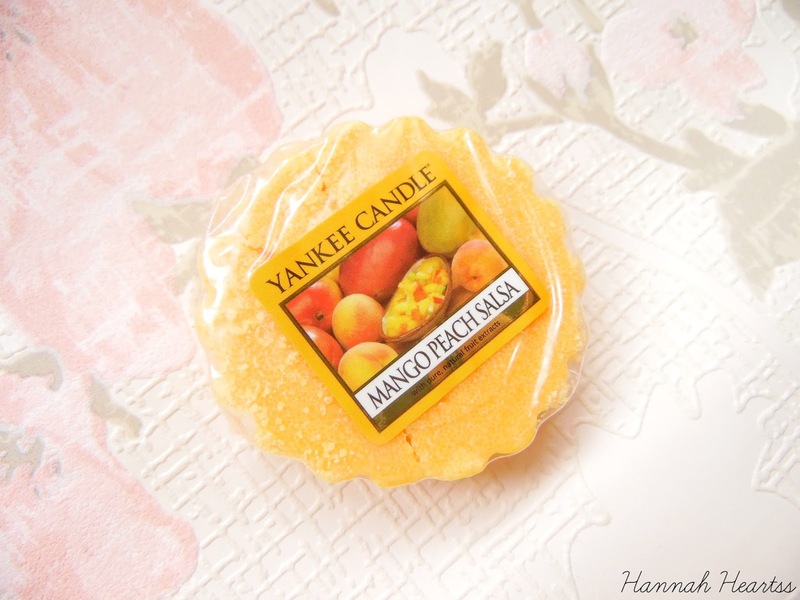 With the sun being out, I wanted some fruity summer scents for my room so I decided to use the Yankee Candle Mango Peach Salsa Tart. Fruit family scents are pretty much my favourite scent type all year round apart from Christmas when I go for more foodie scents. Mango Peach Salsa is a fruity lovers dream especially if you love mangoes like I do. Mango Peach Salsa is described as smelling like sweet and zesty with mango and peaches with hints of citrus, pink pepper and also ginger flowers. This tart smells gorgeous, when I sniff it I get all of that delicious mango and peachness as well as a slight hint of the citrus too. This is a very strong tart which I was happy about, there is nothing worse than getting a weak tart when it comes to candles. As soon as I popped this little tart into my warmer it begun to kick off the gorgeous fragrance. The scent kick off with this one was incredible, I only needed have my warmer on for around 20 minutes to fill my room with the fragrance. I found that if I left my warmer on for any longer than an hour each time, the scent would be too strong for my space but I actually prefer to have it on in shorter blasts. Even after I switched off my burner the scent lingered for over an hour which I was really impressed with as with some tarts the scent tops as soon as the warmer goes off. Each wax tart aims to provide eight hours of fragrance and I definitely got that with this tart if not a little bit more and each burn was as powerful as the first. Mango Peach Salsa Tart retails for £1.49 and it available in any other candle jar sizes and forms.